Vaccination against the human papillomavirus (HPV) is widely thought to confer protection in humans against cervical cancer. HPV studies have recently shown that the vaccines can prevent infection with the strains of the virus found in the vaccine. This has been widely covered in the media. IPAK Scientists, however, are concerned by the lack of reporting in the media outlets of troubling results from the same studies that show that vaccinated women also show a higher rate prevalence of overall HPV infection by rarer, potentially more pathogenic strains of HPV. The studies do not address why, but the data are very clear: vaccinated, sexually active women have shown higher rates of infection with riskier HPV types than unvaccinated, sexually active women (Guo et al., 2015). If you are HPV vaccinated, or are thinking about getting the HPV shot, you may wish to consult with your doctor about this additional risk. Use of condoms can reduce the rate of transmission of HPV overall, and can also reduce the occurrence of unplanned pregnancies. Clinical studies of an antiviral cream containing Ranpirnase have shown promise in directly targeting HPV. Condom manufacturers and personal lubricant products should consider adding Ranpirnase to their products if/when the FDA approves of its use. This statement is not medical advice. IPAK advises all parents to read the studies, and ask your doctor for their interpretation. 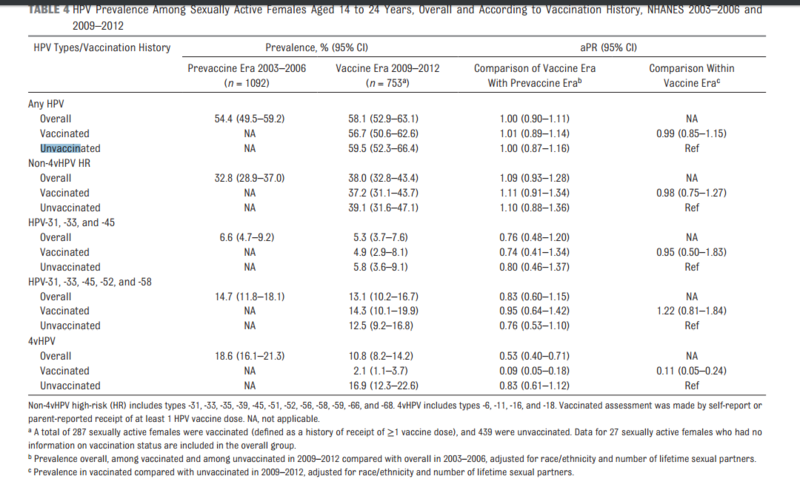 Table from Markovitz et al., 2016: Note there is no significant difference in overall HPV infection between vaccinated and unvaccinated, and slight (but not significant) increase in the rate of rarer HPV strain infection. Guo, Fangjian et al., 2015. Comparison of HPV prevalence between HPV-vaccinated and non-vaccinated young adult women (20–26 years) Human Vaccines & Immunotherapeutics 11: Issue 10, 2015. 11(10):2337-44. doi: 10.1080/21645515.2015.1066948. IPAK: Reducing human painand suffering through knowledge.